The following is a list of the basic supplies needed for the workshop. Please feel free to bring any additional colors you like to work with. I will be working with acrylics because I find them “faster and bolder” but you can work in oils if you choose. 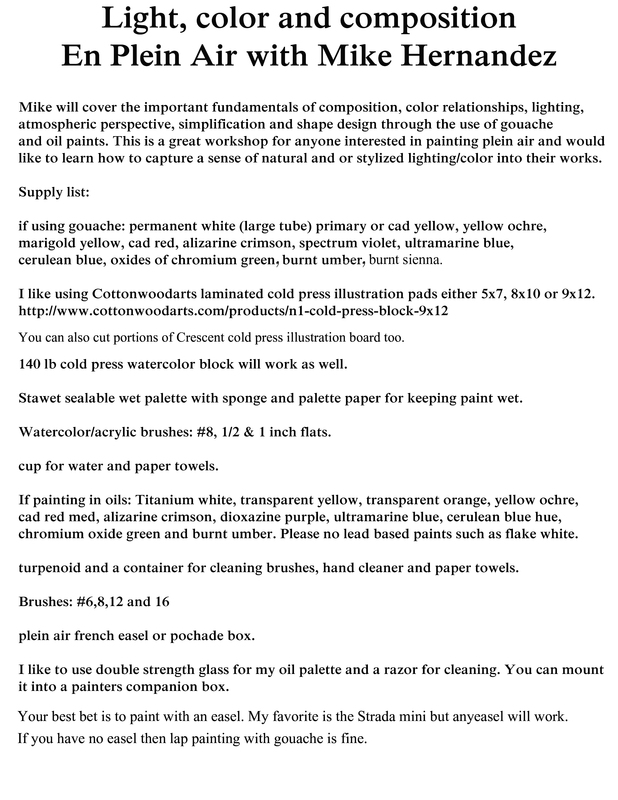 If you work in oils, please bring the colors listed below, or the equivalent pigment in oil color, plus mediums and odorless turps such as Gamsol Odorless Mineral Spirits. Please bring a tube of BLACK paint. Any brand will do. I use Golden Heavy Body Acrylic paints — they are an excellent quality professional grade paint. You can buy student grade acrylic paints, which are much less expensive, but they dry dull and more transparent because there is less pigment in the paint. (Optional: Polymer Medium – you can use this in place of water as a medium) If you want to use acrylics but don’t like the fast dry time you can get Golden OPEN paints, which stay “wet” for hours. I suggest Nylon synthetic flats in varying sizes, from 1/4 “ to 2” width. You can buy these brushes all in one pack from Michaels or AC Moore or Blick, they are not expensive. Oil painters can use bristle brushes. A higher quality option for acrylic AND oil painters is Princeton “Catalyst Polytip” Brushes. They have a wonderful spring and retain their shape after repeated use. I use flats, sizes : 2, 4, 6, 10, 12, 16. For most of the exercises you will be working from my photos (pdf will be supplied upon registration). Please print them out on good quality paper (not plain copy paper, streaked, etc.) If you have a digital display such as an ipad you can work from that if you prefer. You can also bring in photos that you want to paint from. Bring some fabric or colored paper that can be used as a backdrop to your subject. Please bring a disposable grey paper palette, approx. 12×16. You can find these in art supply stores. Get the type that is a waxy paper, not the type that is regular paper. THIS is what I use. Optional: I keep my paints in a craft “bead-box” and dip my brush into that, instead of putting paints out on the palette. I use the grey paper palette to mix colors and tear off the page when it gets full. If you buy a bead-box, make sure the compartments are large enough to fit your 2″ brush in. EASEL: Please bring a small portable easel. An outdoor pochade box or french easel works best in the tight workshop space. We have a few TV trays that can be used to place your palettes on, but bring one if you can. A viewfinder – either store-bought or handmade by cutting a window into a heavy paper or matboard. I use a “view catcher,” an adjustable viewfinder that has a window setting for various formats. Most important: Bring a spirit of adventure, experimentation and willingness to use paint and color courageously!